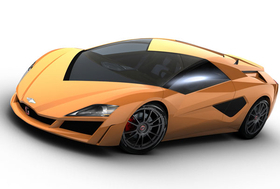 Italdesign says its Geneva concept, the Namir, has a top speed of 300kph and CO2 emissions of 50g/km. TURIN -- Italdesign Giugiaro will unveil a concept for a fast but fuel efficient hybrid coupe at the Geneva auto show called the Namir. The Italian design and engineering company says the two-seater can reach a top speed of 300kph and accelerate from 0kph to 100kph in less than four seconds. The Namir concept will travel 50km on a single liter of gasoline and emit about 50 grams per kilometer of CO2. By comparison, the third-generation Toyota Prius that will also be shown in Geneva will achieve CO2 emissions of less than 100g/km. Giugiaro will announce technical details of the hybrid powertrain at the Geneva show, but a source said that a Wankel rotary gasoline engine powers a generator. Traction comes from electric motors that power each axle, creating a permanent all-wheel-drive setup. The wedge-shaped coupe features a body made entirely of aluminum and carbon, sitting on a carbon fiber chassis.